Just like art, jean cuts, and restrictive fad diets, fancy desserts come in waves. We’ve blown past artisanal cupcakes, artisanal ice cream, artisanal doughnuts, artisanal cronuts, artisanal cookies, artisanal macarons, there was something called a kouign-amann for like two weeks, and artisanal shaved ice to finally arrive here, at our final destination: artisanal soft serve. And it has a legitimate shot to create the same kind of sugar-induced psychosis that cupcakes did all those years ago. Think about the red velvet-pocalypse of 2002. Why was it so incendiary? What caused Sprinkles it to burn the dessert world as we know it to ashes? A few things. First: nostalgia. Pre-Sprinkles, cupcakes were mostly reserved for birthday parties and after-school snacks which inspired yearning for simpler times. Desserts have a long history of being emotional blankets, and cupcakes are the electric heated kind but, you know, with less risk of lighting you on fire in your sleep. Second: fanciness. By introducing flavors like salted caramel and the artificially dyed farce known as red velvet, Sprinkles was able to turn your nostalgia into something new, epicurean, and noble. You’re not giving in to indulgence, you’re being an active participant in culture. You’re a modern day flaneur covered in cream cheese frosting stains. Third: good things happening in your mouth. Come on, you know it—Sprinkles is pretty tasty. 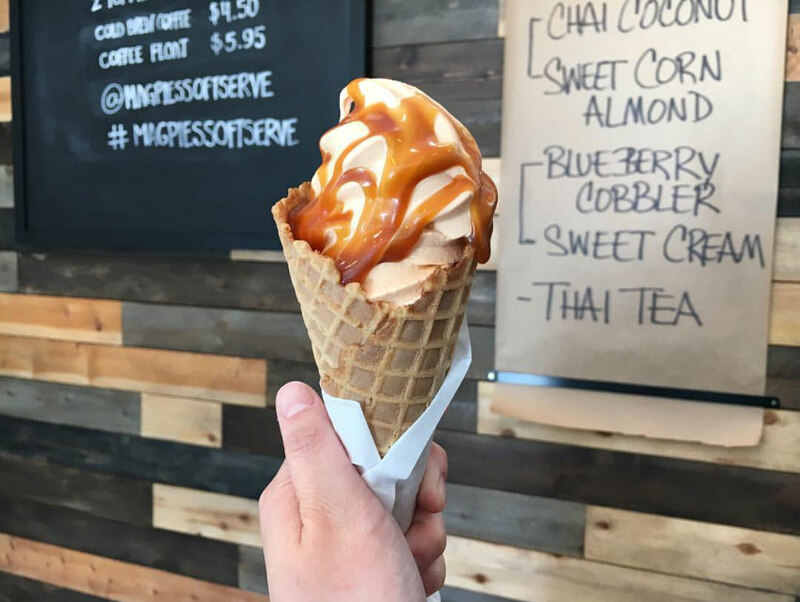 The soft serve at newly opened Magpie’s scratches all the same itches that Sprinkles did. Frozen milk straight from a robot teet brings back memories of Dairy Queen and baseball games and McDonald’s drive-thrus. 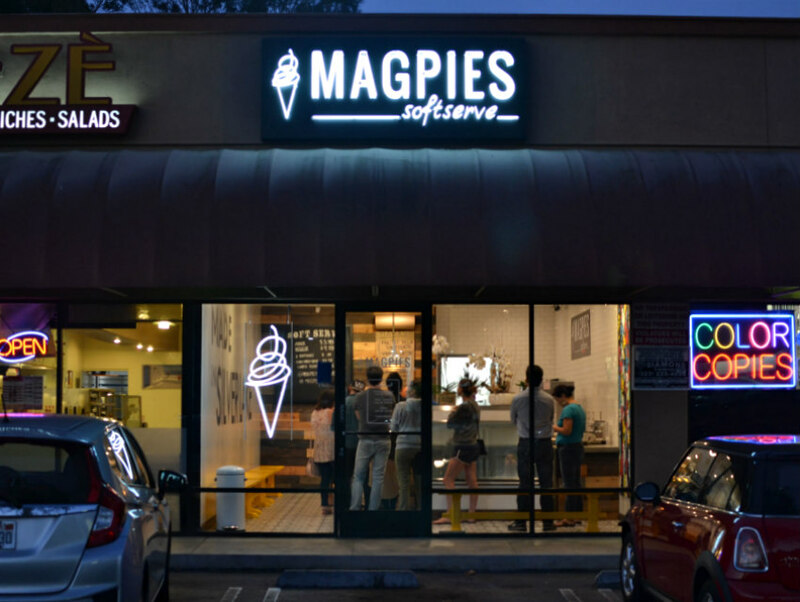 There’s an impressive list of flavors like coconut chai, sweet corn almond, and strawberry rhubarb—and some unusually cool toppings like maple coconut chips—that gives Magpies an elevated feel. Their concise brand image (though does seem a little straight out of the After’s Ice Cream playbook) only reifies the warm and elegant fuzzies. Most importantly, the soft serve from Magpies is super tasty. I can’t say their exact dairy formula and churn speed makes it any better than the kind at, say, Honeymee, or CVT, or Bob’s Freeze, but it’s at least equivalent, and throwing in foodie (you probably hate that word, but I love it) twists like sweet corn pushes it into a whole new echelon.